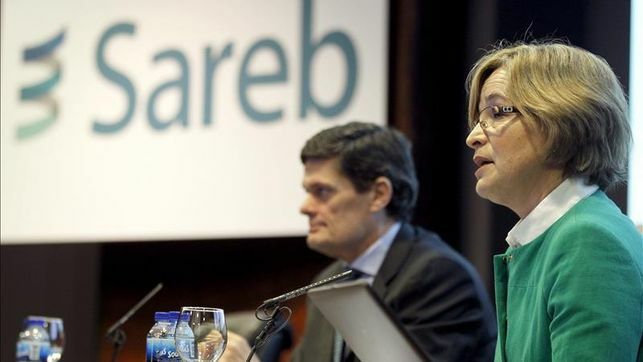 Sareb, the bank that was formerly chaired by Belén Romana (photo, right) and which, following her resignation, is now led by Jaime Echegoyen (photo, left), is about to close its third year of activity. And it is doing so with a great deal of uncertainty over whether it will be able to fulfil the four main objectives it set itself in 2012. Those objectives were: to reduce its balance sheet by 44% by December 2017; to repay 49.9% of its €50,781 million ordinary debt by that date; to have sold 45,000 homes, also by that date; and to guarantee shareholder returns of between 13% and 14%. The majority of its shareholders, even initially, did not expect to receive such high returns. But it seems like the other objectives are not going to be easy to acheive either, above all the main one: to repay €25,000 million of its debt within the next two years, half of which it paid out to acquire its 197,500 assets (more than 107,000 real estate assets and almost 91,000 financial assets). Despite the work performed over the last three years, and having repaid €8,500 million of the €50,781 million that it must return to the savings banks that transferred those assets, it is a long way from achieving the objective set out for the company’s first five years of operation. To repay half of its ordinary debt between 2016 and 2017, it must fork out around €16,000 million. And all of this is happening in an enviable situation in terms of interest rates, which meant that Sareb was able to reduce its financing costs, by lowering the spread on the renewal of its bonds, at the end of the first half of the year and will do so again at the end of 2015. In the event of an increase in interest rates, which will happen, sooner or later, the situation will automatically worsen. The first step that Sareb must take to be able to repay half of its debt by the end of 2017 involves reducing its balance sheet by 44%. So far, as at June 2015, it had reduced its assets by just 14%. And then only thanks to the good performance of the financial assets, which decreased by more than €7,000 million, given that, by contrast, the value of its real estate assets has barely changed from the initial balance of €11,357 million. That lack of variation in terms of the value of its real estate assets is due to the fact that the sales that have been made fall well short of the 45,000 house sales forecast between 2013 and 2017, and because the foreclosure of property developer mortgages have ended up increasing the number of properties on the bad bank’s balance sheet. At the end of 2015, Sareb still owns more than 90,000 of the 107,000 real estate assets that were transferred to it when it was first created, in February 2013, despite numerous campaigns launched in December by both the bad bank and by the servicers entrusted with the sale of these assets. And as if that were not enough, the Bank of Spain published a new accounting circular earlier this year. It was both expected and feared by Sareb, and it obliges the bad bank to individually value its assets at market prices, compared with the criteria used when they were transferred, which involved average discounts by asset type. In theory, the accounting impact of the measure is not expected to alter the revenues streams and, if, as expected, new provisions are required, then they will be drawn from the conversion into capital of the amounts required from the €3,600 million subordinated debt in issue and subscribed to by around thirty investors. Those investors include the State, through the FROB, which is the main shareholder, with €1,652 million, followed by all of the main banks, with the exception of BBVA.